» SILENCER: For applications requiring quiet operation, customs built attenuation packages can be provided on the fan inlet or outlet. attenuators are aerodynamically and are designed to significantly reduce noise while adding only minor resistance to air flow. 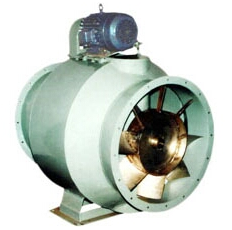 Variable Inlet Vane: For frequent continuous volume control, a variable inlet vane can be provided. Variable inlet vanes are available for each specific fan size and are bolted to the fan's flanged inlet. The vane action during dampering works to spin the air in the direction of the wheel rotation this resulting in lower power consumption. Vane mechanism is outside of the air stream and is controlled buy a single vane lever. Variable inlet vanes can be set up for manual or automatic operation. The variable inlet vane's inlet is flanged and drilled to accept ductwork or and inlet bell as the system requires. Bird Guard: Safety screening can be provided for installation in the fan inlet, fan outlet, cone or belt. Spark-Resistant Construction: Belt Drive / Direct Drive with Spark-Resistant Construction are available. Inlet Bell: For systems with not ductwork on the fan inlet, it is advantageous to install an inlet bell is a torosoidal shape to avoid inlet losses. The inlet bell is a torosoidal shape to provide a smooth entrance to the fan. Inlet bell are flanged and drilled to mate up with the fan's flanged inlet. Inlet/Outlet Cone: Transition pieces, called cones, can be provided for both the inlet and outlet. Cones are provided to adapt from the fan diameter to the adjacent ductwork diameter. Cones are flanged on both ends and drilled to mate up with fan's flanged. Cones are available with an access door if required. Outlet cones can be utilized to affect performance and transform velocity pressure into static pressure. Companion Flanges: For ease of installation of adjacent ductwork, companion flanges can be provided. Flanges are rolled angle rings, drilled to match the fans inlet or outlet flanges. Amaricar Engineering & Systems Pvt. Ltd. is engaged in supply of plant & machinery and process equipment for various industries. We supply products like Hotel / Kitchen / Laundry Equipment, Guestroom Amenities, LCD/LED TVs, Commercial Monitors, Video Walls, Telephones, Media Jacks, IPhone/IPad/IPod Docks etc. to star rated hotels. These products are sourced from leading manufacturers and distributed from India and around the globe directly and through trusted principals. Small volumes are purchased and sold by Amaricar to clients. For volume purchases, Amaricar arranges direct billing to clients from respective manufacturers to make them benefit from lower pricing and to avoid double taxation and to avail concessional duties while importing for hotels/projects. Amaricar is in business from 1978 as a division of a family owned company. From 2010 - it is functioning as an independent entity. But the core values of trust, integrity, customer centric business focus continues.